Nothing compares to the sight and beauty of a rose garden in bloom. Capture this beauty by converting your front or backyard into a rose garden and spend endless hours relaxing amid fragrant roses. You do not need acres of area for a rose garden; you can use the space available, or a portion of it, to create your personal haven. Supplement lack of garden space with trellis structures, arbors, pots and planters and hanging baskets, all filled or supporting roses of different shapes, colors and sizes. Inspect the space available to determine the shape you want the rose garden to take. Also gauge the amount of sunlight it receives every day, as roses require up to six hours of direct sunlight and well-drained soil with a pH level between 6.5 and 7.0 in order to flourish. Sketch the rose garden on scaled graph paper. A formal garden is usually square or rectangular, with symmetrical lines and forms. Include locations for identical-shaped rose beds and any planters or trellises. Draw pathways between beds if the space is large enough, and a bench or two. Make provisions for a small waterfall on a side or in the center, to incorporate the soothing sound of pouring water into your rose garden. Incorporate edging to separate the formal rose garden from the rest of the area, or different beds from one another. You can even use decorative fencing with a gate, and include an archway filled with climbing roses at the entrance of the garden. Form arches with bendable steel rods; wind and secure rose vines to them. Select roses to fit into the rose garden. Decide whether you want to plant seeds or seedlings. Include similar-colored roses in a single flowerbed for a formal garden, or alternating rows of same-colored roses for added appeal. Research or visit your local nursery to select desired rose varieties. Incorporate vigorously blooming roses in the center of the rose garden. Use these to serve as a focal point and surround it with paving stones to separate them from the rest of the garden. 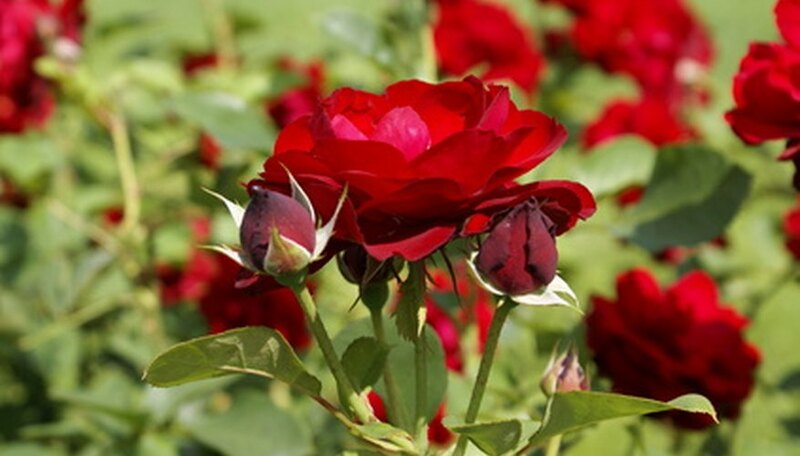 Grow floribundas and grandiflora roses for a continual and vigorous bloom. Sketch the informal rose garden on graph paper. Make it circular, oval, square or any angular shape to give it a relaxed look, with soft, curved lines as opposed to symmetrical ones a formal garden features. Incorporate different-shaped rose beds in the design, and scatter a variation of roses in each for a colored assortment. Include meandering paths leading to different sections of the garden if the space is large. Edge the beds with greenery such as clipped English ivy or other vegetation for a softer look rather than landscaping edging. Install lattice trellises in the ground, or suspend them on the wall and train climbing roses to spread over them, thus providing a colored wall. Make sure the roses you select are adaptable to your environment and climate.